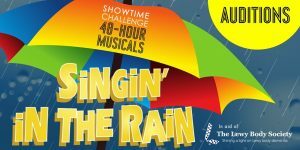 We are holding open auditions for our production of Singin’ in the Rain in London on the weekend of 1 & 2 June. Anyone and everyone (18 and over) is welcome to audition. The show is for charity, so everyone involved gives up their time for free, but it’s an electric experience that you won’t forget!